We aim to provide a great service and we think our campervan is pretty special. Don’t just take our word for it, have a look at some the testimonials supplied by our lovely customers. Really great van, super comfortable and has everything you’ll need. Ann and her husband are lovely and they make the whole process of renting the van a pleasant experience. Will most definitely be hiring it again! Just returned from a trip to the Brecon Beacons in this lovely campervan. It was snow and ice outside but we were absolutely toasty. There is everything you need and more, already in the van for a fabulous trip. Will definitely recommend and will be using Wirral Campervan Hire again soon. The van is superb. Very high spec’d and clean and very easy to drive. Fully kitted out with everything you can think of (and more). Lovely high rising pop top for plenty of space. And the kids loved sleeping up there. Ann and the team are a pleasure to deal with. We all loved the van and the experience. The van we hired is in excellent condition and it was so comfortable to drive with cruise control. Payment and hire process was so smooth. Great company, lovely service and lovely people. 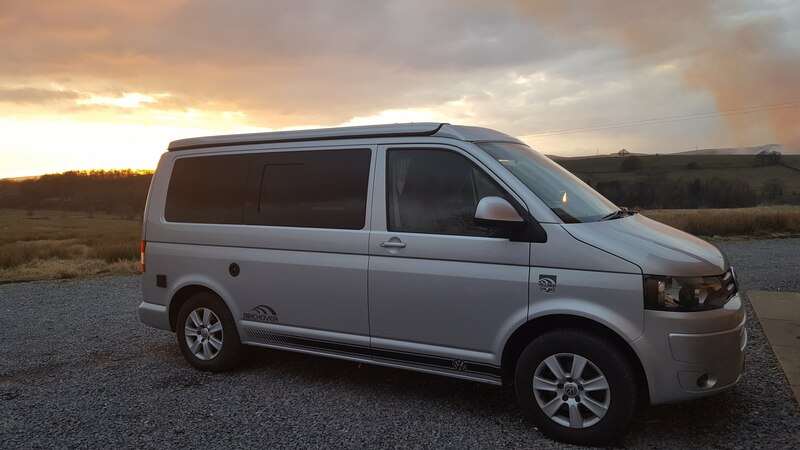 We spent the last week touring round the Llyn Peninsula inthis superb T5 and loved every minute of it. It had everything we needed, immaculate and very comfortable to drive/sleep in. Our son especially loved stargazing from the upper section! The whole experience was great. Communication prompt and clear, a thorough tour of the van and its equipment, and the van itself spotless. We’d a great weekend and thoroughly recommend.